Arguments that stand in the way of proper training. Not all people are built the same or have the same strength or skill, and that means shooting instructors should be more flexible and less dogmatic. American law enforcement officers are hired to seek out and interdict criminals before they can prey upon the citizens they are sworn to protect. That's what they do, so it makes sense for American cops to have a combative mindset. Preparation is a large part of being combative, and training is a large part of preparation. Information really is power, but having the correct information is essential. This leads us to what I call "combative controversies," those subjects that seem to pop up every so often and confuse people on what is the proper course of preparation for conflict. Let's take a look at a few of these controversies in the hope that we can come to some form of détente so those who are truly looking for a path to preparation can move forward. I wrote my master's thesis on this topic, and it proved to be a mistake. My premise was that I would collect shooting data from all over the country and then come to a definitive conclusion. I couldn't. I still collect shooting data to this day, but for every good result I obtained with a given round/caliber I will also get a failure--making it real hard to come to a conclusion. The problem is there are two types of incapacitation: physical and psychological. Psychological incapacitation is impossible to measure as some people will go down with a round through the finger while others will fight on after multiple rounds penetrate their chest. Physical incapacitation is usually explained as violating vital organs of the body that will certainly kill, but it does not necessarily produce an instant stop. Wound patterns in ballistic gelatin provide an apples-to-apples comparison of potential wounding effectiveness, but of course gelatin is not human tissue. Let's set that aside and look at the wound volume for each caliber. Using this methodology, the wound volume of the best .45 is 15 to 20 percent larger than the best 9mm, thus it is safe to say that a bigger bullet is a better bullet. Now the bad news: 15 to 20 percent is not enough to make up for poor shot placement, so we still have to hit something important in order for our handgun round to be deemed effective. We must also take into account the likelihood of missing. If a miss occurs, we must be able to get back on target quickly for a fast follow-up shot. 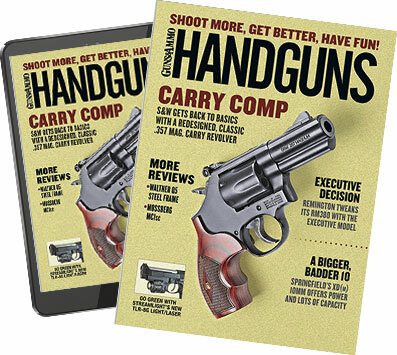 Select the largest caliber handgun you can control under rapid fire given the level of training and practice time you possess under the weather conditions you are likely to face. Once you have determined this, practice until you feel confident. Take a moment to think about what we are arguing here. The Weaver stance as it is taught today is more square to the target because everyone realizes that in a fight you will face your attacker, so the bladed position is gone, and the sole argument is whether the support arm should be bent. Doing so, Ã la the Weaver, pulls the shooting arm back into the body like a rifle stock while the isosceles pushes the gun forward like stabbing with a spear. Both control recoil well enough to use at fighting distances, so who cares? Some argue that in actual combat shooters will naturally straighten their arms, but I have seen plenty of videos shot from cameras mounted in police cruisers where officers are shooting with a bent support arm during a gun battle, so what gives? The fact is that you will do in a fight what you have trained yourself to do, given you have had more than just minimal training. I have trained thousands of basic police recruits, and some shoot better with the Weaver while others shoot better with the isosceles, so I let them find the body position that works best for them. The only thing I insist on is they lock their shooting arm as best they can. Why? It is consistent with what they will do when shooting with one hand, which happens more often than many realize and negates the argument regarding the supporting arm. In the end, we need to prepare students to fight, not shoot. They will probably not have the optimal stance/body position during a fight, so let them do what works best for their physiology while preparing for combat versus shooting holes in paper. How well will our fingers work during a crisis event? This seems to depend on what the instructor wishes his doctrine to include. For example, I attended a school in which the instructor told us we needed to grasp the slide on our pistols manually because we would not have the digital dexterity to use the slide stop lever. Okay, I can see that, but during a carbine course this same instructor told the class that when reloading to insert the magazine and then roll the thumb up and hit the bolt release lever to reload. When I privately inquired about what I felt to be a discrepancy, the instructor said, "The size of the slide release on a pistol varies, but the bolt release on an AR will always be the same." When I asked about the dexterity needed to press a trigger, hit the magazine release button or even grasp and insert a magazine into a pistol, I was told, "Proper training will prepare you to accomplish these tasks without conscious thought." But not hit the slide release, I guess. When showing him that the slide release on my pistol was substantial, he said: "You can't be assured that you will be using your gun. You might have to pick up a gun in the middle of a fight." But isn't it far more likely that I will start and finish a fight with the gun I have on me? Well, he said, you never know. That's true, but isn't it likely I'll use the gun I have? So the question you need to answer for yourself is whether you want to spend your valuable training time on what's possible or what's likely. Another instructor told me "Just because something is faster does not mean it's more efficient." "Efficiency" is one of the new training buzzwords, and in this class, I was clearing malfunctions by turning the pistol sideways--inverting the ejection port down so gravity would help clear the chamber. That allows me to grasp the slide with the heel of my hand, thumb, index and middle fingers, which I think are the stronger than the ring and pinky fingers. The instructor told me I should reach up and over the slide and "power stroke" it to the rear. If you choose to use this technique, that's okay, but I believe my way is stronger, and it works with pistols of any size. If you work the slide of a small gun his way, your hand covers the ejection port--creating a stoppage--or you will have a minimal ring/pinky finger grip on the slide. For me, my way is faster. Isn't it more important for a shooter to complete a given task with ease than getting all wrapped up in how it is accomplished? Doctrine, not dogma, should be the rule of thumb. Training someone to prevail by giving them options and finding what works best for their physiology, instead of trying to prove who is "right," should be the goal.